Just as a score of racetracks along the East Coast were forced to close due to the most ambitious hurricane to make landfall in decades, I was forced to watch the trees on my land in southcentral Pennsylvania bend to unnatural angles when Hurricane Irene swept more westward than forecasted. Thousands of citizens in the Susquehanna Valley lost power for more than a day due to the storm. We resorted to ancient forms of communication and creative survival, obviously leaving out the possibility we could connect to the Internet. So we apologize for the late review. Just before we were attacked by 60-plus-miles-an-hour winds on Saturday, Aug. 27, we scored in the first elim of the Canadian Pacing Derby at Mohawk. Foiled Again came back strongly, as we thought he would after his second in the “Haughton” the week before to win and pay $9.60. The second elim presented a problem for our choice, Aracache Hanover as he broke off the gate and though he gallantly strove to make a comeback only 3 lengths off the winner he finished sixth. Then, in the first Metro Stakes elim, we were handed a strong $8.90 win from D Terminata. We picked up the second elim, though Speed Again was the choice, paying $4.60. 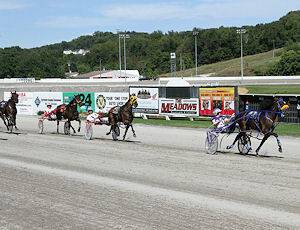 Our third choice, All Star Legend, was second at 9-1, having been defeated by a 20-1 shot. To no one’s surprise, American Jewel won the first elim of the She’s A Great Lady but did not offer the fine price she paid the week before—she paid $2.30. Much to our surprised, our American-National pick for the colt trotters won as the favorite. We thought GJ Photovictory would provide a two-digit win mutuel for victory but he only returned $5.20. Our filly choice, Lady Rainbow, was third. The night before in the Kindergarten Series legs at Vernon, we had one winner, Sandra Volo, at $6.80. It was bound to happen but it happened with a filly we have been touting all summer as Idyllic handed See You At Peelers her first loss, ending her win streak at 22. Idyllic lost all five of her 2011 starts and we liked her in each one because she is a good filly and always races well against this division. 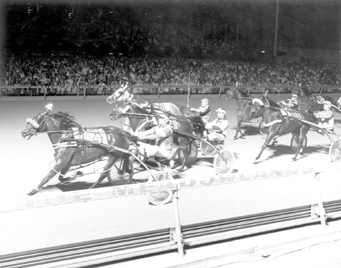 The three-year-old sophomore pacing fillies have been dominated by “Peelers” at three, as they were at two and in this race, the $193,150 Nadia Lobell at the Meadows, most of the usual suspects were on hand. But a bad post and a blazing first half took its toll on Peelers and she tired as Idyllic defeated her going first over. Idyllic, however, only paid $12. Trainer Jimmy Takter said that Peelers came out of the race fine. She is still a future-book choice to beat the boys in The Little Brown Jug. The great filly that Peelers was being compared to since her winning streak carried from two to three, died just before Peelers streak ended. Fan Hanover was 33. The unique Xtreme Racing program at Georgian Downs took place last weekend. You have to see some of these events to appreciate them, so check them out here. I love when harness racing goes out on a limb and gets creative with what is sometimes a stubborn format. The Xtreme races are great and there should be a lot more of them incorporated into harness track menus across North America.